Boeing delivered Nok Air’s 21st Next-Generation 737-800 during a ceremony at the Seattle Delivery Center. The celebration marked the third direct-purchased 737-800 to be delivered to Nok Air. Boeing Flight Services pilots flew Nok Air’s newest 737 to Bangkok and kicked off a world-class flight training program with the airline to help strengthen the capabilities of Nok Air’s rapidly expanding flight crew. Boeing Flight Services provides integrated offerings to drive optimized performance, efficiency and safety through advanced flight, maintenance and cabin safety training as well as simulator support and services through a global network of campuses on six continents. According to the 2015 Boeing Pilot & Technician Outlook, an industry forecast of aviation personnel demand closely tied to projections for new airplane deliveries around the globe, 226,000 new commercial airline pilots and 238,000 new technicians will be needed in the Asia-Pacific region through 2034. 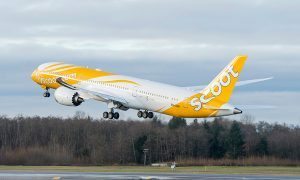 “There is a growing demand for well-trained pilots in Thailand, and we look forward to working with Nok Air as they continue to expand their operations in the busy Asia-Pacific region” said Steve Taylor, Chief Pilot, Boeing Flight Services. Asia leads the world for demand of new commercial airplane deliveries over the next 20 years. By 2034, 14,330 new airplanes worth $2.2 trillion will be needed in the region, according to Boeing’s 2015 Current Market Outlook. By providing customers the support and services they require, such as pilot training, Boeing provides customers a competitive advantage by solving real operational problems, enabling better decisions, maximizing efficiency and improving environmental performance.